Snap are proud to introduce the new HP315R retro-fit collar – our largest retro collar to date. The 202 mm high collar has so far been tested with 315 PVC under a 150mm thick concrete slab. More tests upcoming. A revolutionary new method of setting out collars with pinpoint accuracy. Our patented Locator Plates can be positioned on the formwork prior to the collar being installed. The collar then clips on top and is secured with cleats. Locator Plates also prevent the ingress of concrete into the collar and pull away when the formwork is struck to leave a neat hole under the slab. Black for black Floorwaste and Shower Collars and white for white Stack Collars. The powerful new LP100R-D low-profile retrofit collar for pipes of diameter up to 110mm. Tested with 80mm PVC in a Floorwaste system, and PVC and HDPE pipes run through a 75mm Hebel Powerpanel wall. More Tests pending. The new SNAP Low-top cast-in range provides an integrated system where a single collar can now be used to provide a secure fit to a number of pipe sizes. There is no more need to buy three sizes of collar to fit 100, 80 and 65 pipe: clip in adaptor rings can be used with the Low-top 100 collar to convert it to the desired size. Likewise, the Low-top 50 collar comes with a Reducer Ring in place for 40mm pipes that pops out to convert the collar into a standard 50 Low-top. Additionally, the plastic casing has been changed to a reinforced single-piece case with the same footprint as the High-top collars, providing a visually uniform and more durable range of collars. 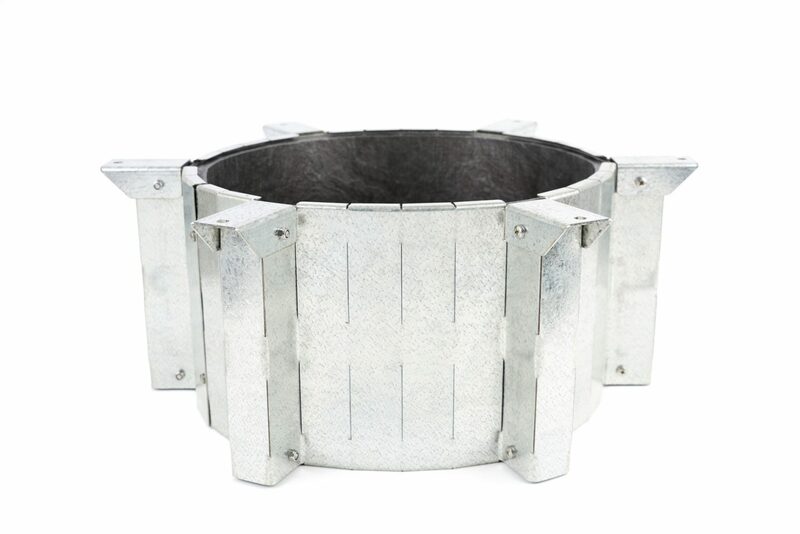 The new collars are the L50-40FWS, L50-40S, L100FWS, L100S, L100FWS with 80 Reducer Ring, L100FWS with 65 Reducer Ring, L100S with 80 Reducer Ring, and the L100S with 65 Reducer Ring. We have begun production and the new Low-top Cast-in range and Reducer Rings are available now from SNAP distributors. The LP200R is a Low-Profile retrofit collar for 200mm HDPE stack pipes penetrating a concrete slab. New modular extension range for the SNAP H100FWS-RR and SNAP H100S-RR Cast-in collars. Each extension adds 50mm of height to the collar and as many can be used as desired to reach the required slab depth. SNAP Fire systems are proud to announce the release of our re-designed Cast-in collar range. With a focus on durability and ease of installation, the new ultra-tough, rigid, single-piece casing has been created with industry feedback in mind. Available in the H150FWS, H150S, H100FWS, H100S, L100FWS, L100S, H65FWS, H65S, H50FWS, and H50S collar sizes. All High-top collars now have an internal rubber-ring fitted as standard.